To those following my recipes (thanks Mom! ), I apologize for including onion tart recipes two months in a row. But as I flipped through our old copy of “Mastering the Art of French Cooking” this particular version evoked a visceral reaction (i.e., hunger) and a memory (i.e., fond) of a 1996 bicycle tour through Provence. Perhaps it was the beautiful scenery, or maybe the number of calories we burned every day, but by lunch time I was game to try anything I could recognize on the menu. In what may be a male extension of never asking for directions, I equally refused to break out the translation book to interpret French Menus – I figured an occasional culinary surprise might make the trip more memorable. I mean, what could possibly be so bad? Except for ancovies, which I hated. Until this little tart came along, gave me a seductive wink, and took me for a ride I’ll never forget. If prepared properly, the anchovy adds a barely discernable enhancement you can’t quite identify as “fishy”. A very wine-friendly dish, as long as the wine is not too tannic – the saltiness from the olives and ancovies only serves to enhance the roughness. Otherwise, pair this with most any medium-to-full bodied white or light-to-medium bodied red. Avoid dry rosé wines at all cost, unless you feel you deserve a heavenly experience! Cook the onions very slowly in the olive oil with the herb bouquet, garlic and salt for about an hour. Discard the bouquet and garlic. Stir in ground cloves and pepper. Taste and adjust seasoning. Preheat oven to 400°F. Spread the onions in the pastry shell. Arrange anchovies over the onions in a sun-burst shape. 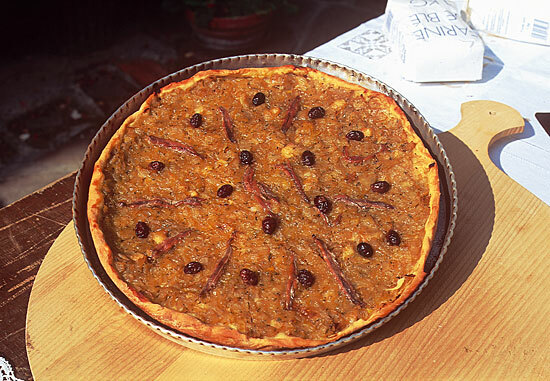 Distribute the olives evenly across the tart and drizzle lightly with olive oil. Bake in top third of oven for 10-15 minutes or until bubbling hot. Julia’s recipe was written 25 years before the food processor, but I think she’d have found it a useful addition to her kitchen. So I recommend its use to simplify the making of your pie crust and assure fool-proof results! Combine the flour, sugar and salt in the bowl of your processor and pulse briefly to combine. Add the cold butter while pulsing repeatedly just until it combines with the flour and resembles small gravel or clumps of oatmeal. With the motor running, drizzle in the ice water just until the dough comes together in your bowl – stop as soon as it forms a ball. Remove everything from the bowl, dust with flour, kneed twice or thrice and then form into a ball, flatten to about an inch thick, wrap it in plastic wrap and freeze for 15 minutes or refrigerate for an hour. Remove your crust and let it warm for just a few minutes. Unwrap it and sprinkle four over a flat surface and begin rolling out your crust, working from the center to the edge, turning ¼ turn, roll, turn, roll, turn…and repeat until dough is sufficiently thin and well shaped (add flour to rolling surface as needed.) Place crust in an 8” tart pan, and bake at 400 (F) for ~9 minutes. Remove and cool completely before filling. When I first tasted this dish, it was paired with a Rhone wine. I have difficulty imagining a more perfect pairing, but this first wine is a bit pricey for many budgets, so I’ve also included a very food-friendly Merlot (and no, I don’t need to hear the old joke again) as an affordable alternative. I’ve also suggested a blush wine, one of the sign post wines of Southern France, and perhaps the most versatile of the still wines when paired with food! Though this wine was not included in our club shipment, that is not a reflection of a lack of quality. In fact, it’s the only blush wine in my portfolio this year. Which is saying something. It’s just that, after four years of evangelizing blush wines, then being stuck with excess inventory after their purpoted popularity exceeded the reality, I finally realized that these wines were best relegated to the specialty shelf. For those of us who enjoy these great, dry wines, you’ll not be saddened once the cork is separated from this bottle! A saignee from Elkhorn Peak’s estate pinot production, this wine is relatively deep in color, despite just 8 hours of skin contact at relatively cool temperatures. It’s flavor is true to type – red fruit notes of strawberry and cherry, with enough acidity to evoke a squeeze of lemon over the whole fruit pile. See if you don’t also find a bit of sassafrass in there!